As Principle Creative I thought it best to have more academic approach to the overall look and feel to this piece. The Merrill Lynch Strategic Balanced (MLSB) is a mathematical algorithm that runs through the S&P 500 to deduct market trends, trades and investments, eliminating the human behavior factor. The goal is to have a stable return in changing markets. The photography chosen is representative of balance and change while maintaining forward motion. I made a clear decision not to use photographs of people throughout this brochure to emphasize the systematic approach that happens without human manipulation. The inside of the brochure is full of complex concepts that I simplify for “at a glance” understanding. The charts and graphs are accompanied with imagery of nautical instruments for balance and direction. 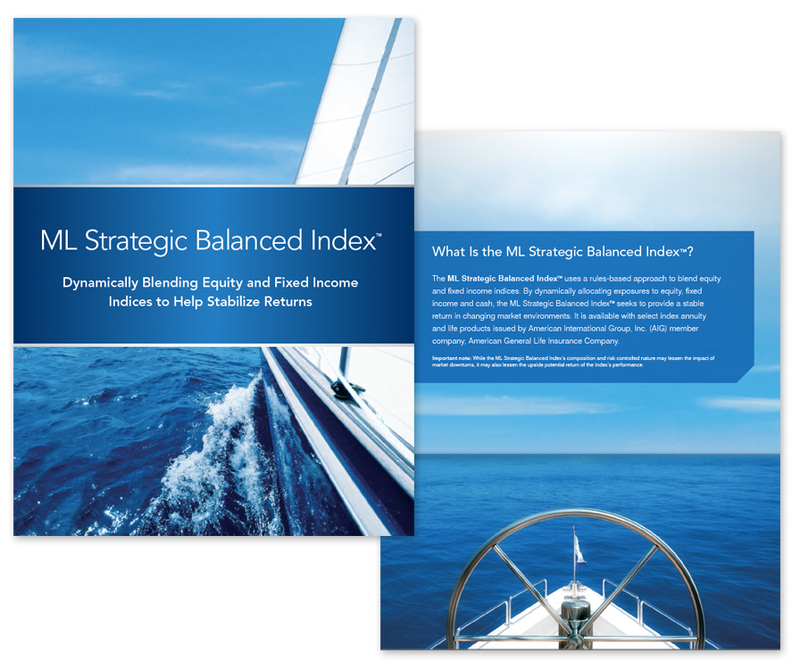 Pushing the science and math behind the MLSB visual proved very successful and was highly received by advisors and senior executives.